Compton is a (fictitious) small town situated in Devon, about 6 miles South West of Exeter. 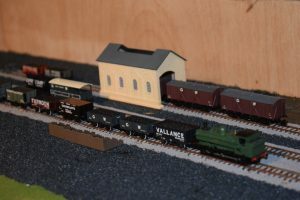 The Great Western Railway links the town at Compton End Station through a meandering branch line up to Exeter St. Davids. The layout depicts the town during the 1930s, when the main traffic would have been farm produce, such as milk, and cattle for market in Exeter and beyond. Other goods traffic is incoming coal from the Somerset and Wales coalfields for domestic uses such as heating, as well as foodstuffs and other general goods for people in the town. The line also has a passenger service for commuters and the occasional hill walker keen to explore the nearby countryside. 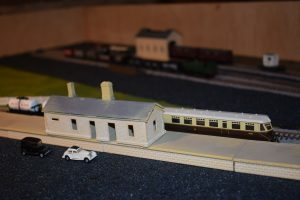 The town has recently undergone some expansion during the house-building boom of the ’30s, which the Great Western railway anticipates will increase passenger traffic on this line. The railway hopes that this new development coupled with recent cost-saving measures in the form of a diesel railcar will improve the line’s fortunes in light of growing competition from local bus services. 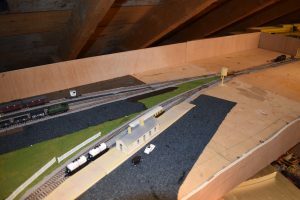 The layout measures 8′ long x 2′ wide (including fiddle yard) and is operated by analogue control with sections that can be isolated to enable multiple trains to be used at one time. 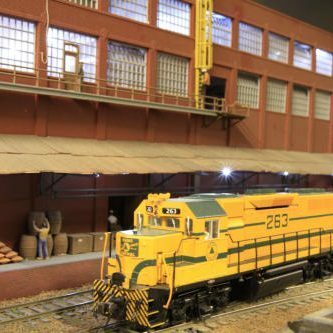 Trackwork is Peco code 55 with points controlled by servo motors to give realistic slow-action movement. 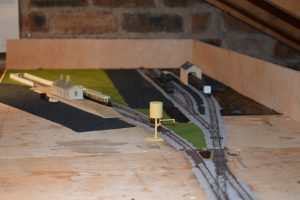 The layout is not finished yet, but buildings will be lit and are to feature full interior detail.